With a wide variety of holes sizes, percentage of open area, high strength-to-weight ratio and aesthetically pleasing, perforated metal sheet has endless applications such as enclosures, partitions, sign panels, guards, screens, and more. PalmSHIELD has been incorporating perforated metal panels in our robust exclusive PalmSHIELD frames and column systems for over twenty years. Perforated infill is perfect when you want to show a silhouette of what is behind your screening but nothing more. Playgrounds, mechanical equipment and divided walkways are perfect applications for this material. You can obscure what is behind the screen but you can still see others moving about. Perforated sheet also provides exceptional wind flow as hole sizes and on-centers can vary. Perforated metal sheet is available in any of the following standard patterns or request a custom pattern. Our custom perforation presses are capable of producing a wide variety of designs. Perforated metal sheet thicknesses can vary from .032” up to .25”. Hole sizes will range from 1” down to 3/32”. Hole centers will vary from 1 ¼” to 1/8”. Holes may be staggered, straight or staggered vertically. 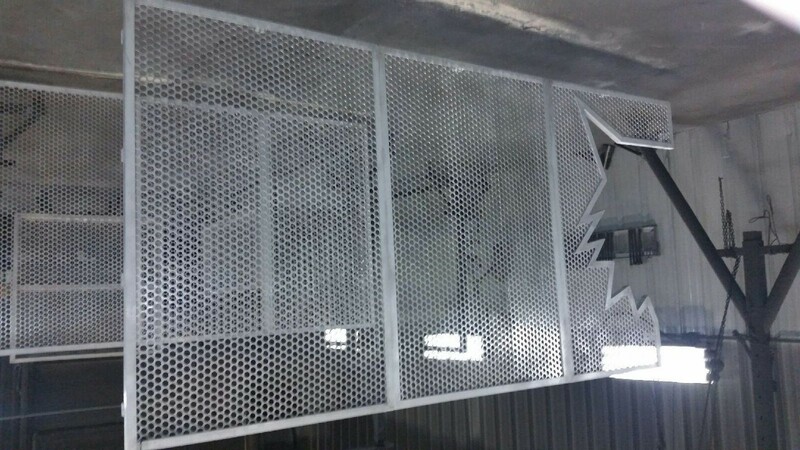 Your selection of perforated metal sheet will be enhanced by our robust framework. We will engineer a system that adequately supports the selection of your materials and meets your needs. PalmSHIELD is more than just great louvers. We provide a wide array of screening options in our exclusive PalmSHIELD framework system.